Javier Hernandez, Rafael Navarro, and yours truly all in looooove. 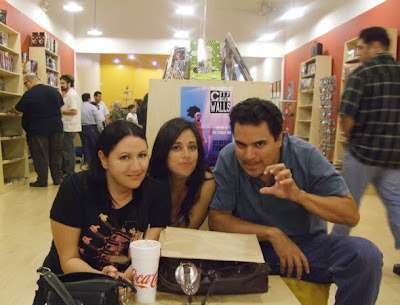 Gras (Cartoonista extrodinare), Leann (wifey), and yours truly. Grrrrrr! Had a blast a couple of weeks ago at GEEKS comic shop in Whittier at my friend Rafael Navarro's art show. Rafael created Sonombulo, the luchadore that can read your dreams. Food, Friends, and Frolicking. Thanks to Sal at GEEKS for throwing such a cool party for such a cool artist! 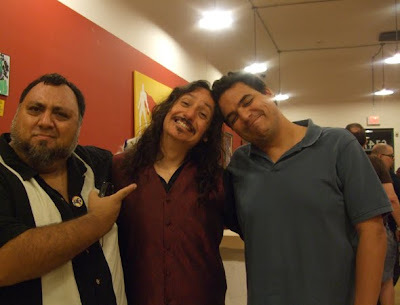 MORE PICS AT CARTOONISTAS.COM! Great photos. I love Rafael Navarro's work. I know you have thought about making DVD's someday..(and want them to be pro quality and have happy people buying them). I have used many companies, but these guys are the best. You can get 5 discs or 100. Very cheap and the discs and the printing (on the disc) is fantastic. A great presentation. When it comes time to make dvd's Jim, give these guys a call and ask for DJ. They are great people. Back to the editing room.